Here&apos;s a sad fact, one that&apos;s both impossible to confirm and seemingly irrefutable: domestic violence affects all walks of life. Doctors, lawyers, teachers, truck drivers, judges, magazine editors: given the depth of the domestic violence problem in the United States and the world, it&apos;s hard to imagine there aren&apos;t abusers in every profession. Floyd Mayweather, who&apos;s been arrested or cited for partner abuse seven times involving five different women in the past 12 years, is not the only one. But, today at least, he&apos;s the most talked about two-time domestic battery convict in the world. How Mayweather&apos;s history makes you feel about him, or tonight&apos;s fight, is up to you, of course. But given that Mayweather is in the spotlight today, this is an opportunity to remind ourselves of just how pervasive the problem of domestic abuse is in this country, and around the world. For instance, based on current averages, more than 675 women have been murdered by their husbands or boyfriends since Mayweather last fought. It&apos;s a scourge that will not go away after tonight; as these damning facts attest, there is much work to be done. 1. 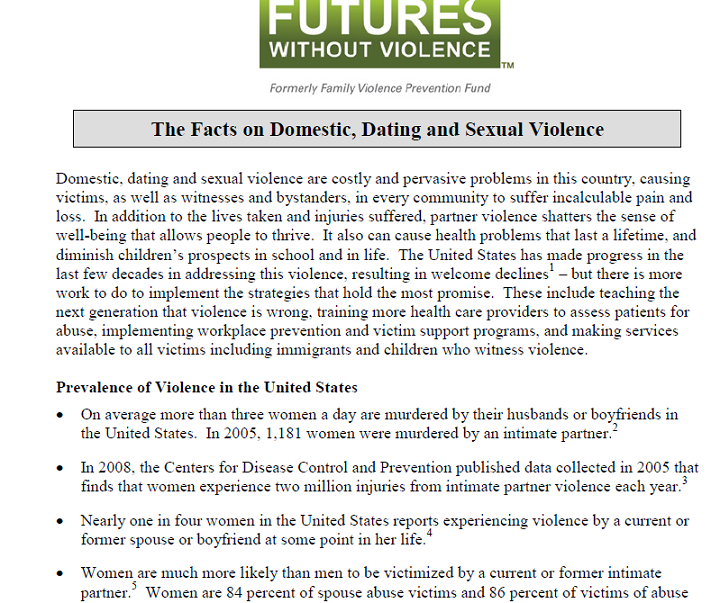 On average, more than 3 women a day are murdered by their husbands or boyfriends in the United States. 2. Nearly one in four women in the United States reports experiencing violence by a current or former spouse or boyfriend at some point in her life. 3. Women make up 84 percent of spouse abuse victims and 86 percent of victims of abuse at the hands of a boyfriend or girlfriend. 4. About three-fourths of the persons who commit family violence are male. 5. Women ages 20 to 24 are at the greatest risk of experiencing nonfatal intimate partner violence. 6. 15.5 million children in the United States live in families in which partner violence occurred at least once in the last year. 7. 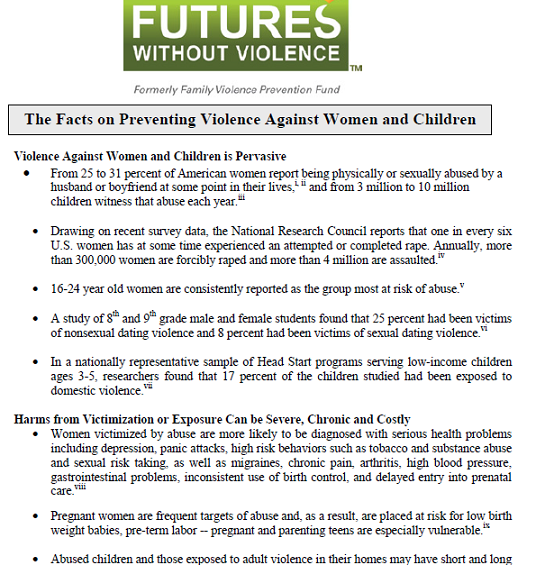 Seven million children live in families in which severe partner violence occurred. 8. Approximately one in three adolescent girls in the United States is a victim of physical, emotional, or verbal abuse from a dating partner. 9. Women who have experienced domestic violence are 80 percent more likely to have a stroke, 70 percent more likely to have heart disease, 60 percent more likely to have asthma and 70 percent more likely to drink heavily than women who have not experienced intimate partner violence. 10. The United Nations Development Fund for Women estimates that at least one of every three globally will be beaten, raped or otherwise abused during her lifetime. In most cases, the abuser is a member of her own family. 11. 2 out of 3 children are exposed to trauma and violence. 12. 1 in 5 tweens knows a victim of dating abuse. 13. 1 in 5 women is sexually assaulted in college. 14. Women experience two million injuries from intimate partner violence each year. 15. 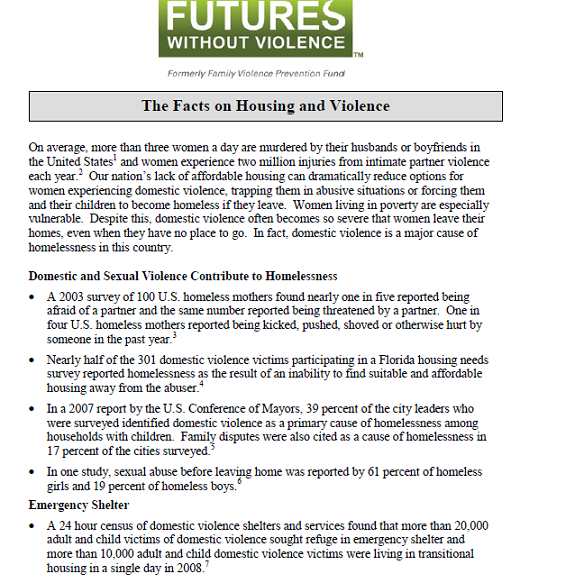 1 in 5 U.S. homeless mothers reported being afraid of a partner or threatened by a partner. 16. 1 in 4 U.S. homeless mothers reported being kicked, pushed, shoved, or otherwise hurt by someone in the last year. 17. Sexual abuse before leaving home was reported by 61 percent of homeless girls and 19 percent of homeless boys. 18. 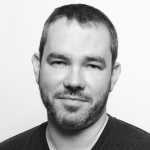 A study of 8th and 9th grade male and female students found that 25% had been victims of nonsexual dating violence, and 8% had been victims of sexual dating violence. 19. Women victimized by abuse are more likely to be diagnosed with serious health problems including depression, panic attacks, high risk behaviors such as tobacco and substance abuse and sexual risk taking, as well as migraines, chronic pain, arthritis, high blood pressure, gastrointestinal problems, inconsistent use of birth control, and delayed entry into prenatal care. 20. Pregnant women are frequent targets of abuse, and, as a result, are placed at risk for low birth weight babies, pre-term labor; pregnant and parenting teens are especially vulnerable.